It’s a foggy evening here in Milwaukee. Only after I’d already taken this photo did I realize that someone was running toward me down the middle of the street. Kind of an eerie night, but peaceful and quiet. Nothing except the sound of dripping water . . . and this runner’s footsteps. 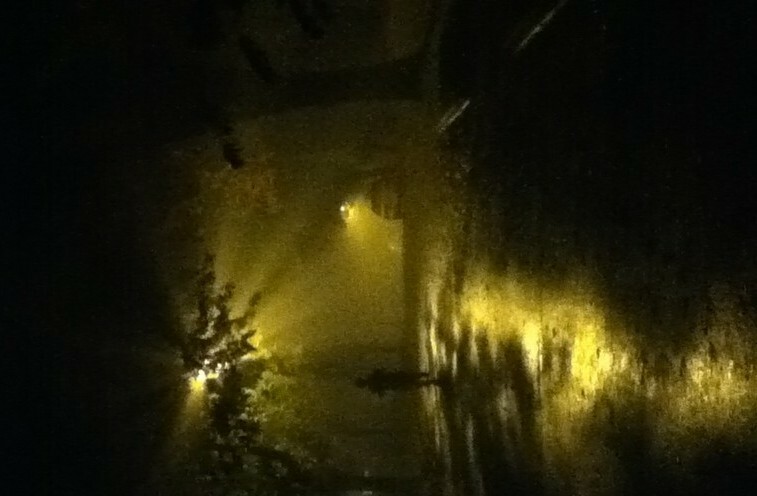 This entry was posted in Milwaukee and tagged fog, light shining through fog, photo of runner in fog. Bookmark the permalink. Thank you! If I didn’t have a blog, I wouldn’t have taken the photo. It was so foggy last night, and I thought, “Oh, isn’t that pretty, the way the lights are breaking into rays through the tree branches.” Only because of the blog did I think, gee, I should grab a photo. My other tries aren’t as good as this one. It was totally an accident that this person was running down the street when I took this picture. Without him, the overall idea of the picture just isn’t the same.